European Union justice and home affairs ministers agreed on February 25 2016 to propose obliging EU countries to carry out systematic checks on everyone, including EU citizens and members of their families who are not EU citizens, when they cross an external border of the bloc. The procedures proposed will involve checks against databases on lost and stolen documents, “as well as in order to verify that those persons do not represent a threat to public order and internal security,” according to a document adopted at the ministers’ meeting. The obligation will apply at all EU external border points, including air, sea and land, both at entry and exit. This position adopted by the EU ministers will be taken to negotiations with the European Parliament once that body has adopted its position, a statement said. “Strengthening our common external borders by reinforcing border controls is an important means to fight terrorism and protect the safety of European citizens,” said Klaas Dijkhoff, minister for migration of the Netherlands, the country currently holding the rotating presidency of the EU. 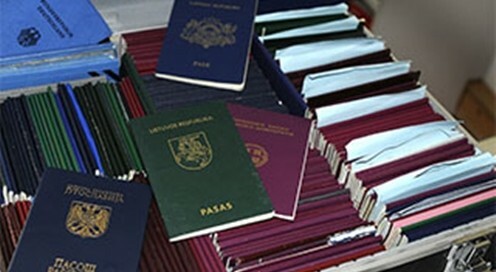 The EU ministers said that where a systematic consultation of databases on all persons enjoying the right of free movement under EU law could lead to a disproportionate impact on the flow of traffic at a sea and land border, member states may carry out only targeted checks against databases, “provided that a risk assessment shows this does not lead to risks related to internal security, public policy, international relations of the member states or a threat to public health”. As regards air borders, the EU ministers agreed that EU countries may use this possibility, but only during a transitional period of six months from the entry into force of the amended regulation. Speaking after the EU ministers’ meeting, EU Migration Commissioner Dimitris Avramopoulos said, “in the next 10 days, we need tangible and clear results on the ground. Otherwise there is a risk that the whole system will completely break down”. “We had a good discussion on our proposal for a European Border and Coast Guard, and the Dutch Presidency is committed to reaching an agreement by the end of June,” Avramopoulos said. On the proposal by the European Commission for systematic checks of everyone who crosses the external EU borders, including EU citizens, he said that he was glad that EU member states were “moving forward” on this proposal, and said that he looked forward to working with the European Parliament so an agreement can be reached soon. Avramopoulos described the situation in the Western Balkans as “very critical”. “The possibility of a humanitarian crisis is very real and very near. We cannot continue to deal through unilateral, bilateral or trilateral actions; the first negative effects and impacts are already visible. “We have a shared responsibility – all of us – towards our neighbouring states, both EU and non-EU, but also towards those desperate people,” Avramopoulos said. “We cannot continue with the wave-through policy – the European Council was crystal clear on this. And we cannot put caps on how many asylum seekers we receive. This is simply not according to EU and international rules. I have reminded member states today, that everyone must respect and apply the rules,” he said. “To those who think that we need national solutions because a European approach is not working, I say: it is precisely national actions that are hindering a European approach,” Avramopoulos said. Austria, Serbia and Macedonia have taken their own steps to limit entry to migrants, angering Greece, which fears the controls will cause a bottleneck. Greece has recalled its ambassador to Austria amid sharp divisions among EU states over the migrant crisis, the BBC said on February 25. Deutsche Welle reported that ahead of the meeting of EU ministers on February 25, Luxembourg’s foreign minister, Jean Asselborn, warned that the continent’s current approach to the crisis could be disastrous for European unity. “We have no common line any more, we are steering somehow into anarchy,” Asselborn said. The top United Nations human rights official expressed serious concern on February 25 over security measures adopted last week by the police chiefs of five European countries, which he warned are already negatively impacting the human rights of refugees and migrants in southern and central Europe and compounding the “already exceptionally difficult situation” in Greece, the UN News Centre said. Urging the five countries that adopted the measures – Austria, Croatia, the Republic of Macedonia, Serbia and Slovenia – to “carefully recalibrate” the approach of their police forces, UN High Commissioner for Human Rights Zeid Ra’ad Al Hussein emphasised that the measures are exacerbating “the chaos and misery all down the line,” and especially in Greece, which is already overwhelmed. “Alarmingly, given the primary duty of the police to protect people, the agreement contains no measures aiming at protecting these extremely vulnerable women, children and men on the move – there is, for example, not even a mention of special measures to protect people who might be particularly at risk of human rights violations, including children, persons with disabilities, LGBT persons, older people, victims of torture or victims of gender-based violence or trafficking,” Zeid said in a statement. “Instead, the agreement appears to be solely concerned with applying stringent limitations of entry on people travelling along the so-called Balkan Land Route, and providing for the ‘controlled transfer of migrants,’ without sufficient safeguards,” he said. The adoption of the police measures this past week followed the announcement by the government of Austria of limitations both on the number of refugees to be accepted in 2016, and on the number of people who will be allowed to transit the country. The latest reports suggest chain deportations are now taking place all the way down the Balkan land route, which includes Austria, Slovenia, Croatia, Serbia and Macedonia, towards Greece, Zeid said.